That 7" Nook tablet which showed up on the FCC website a few weeks back is now official. 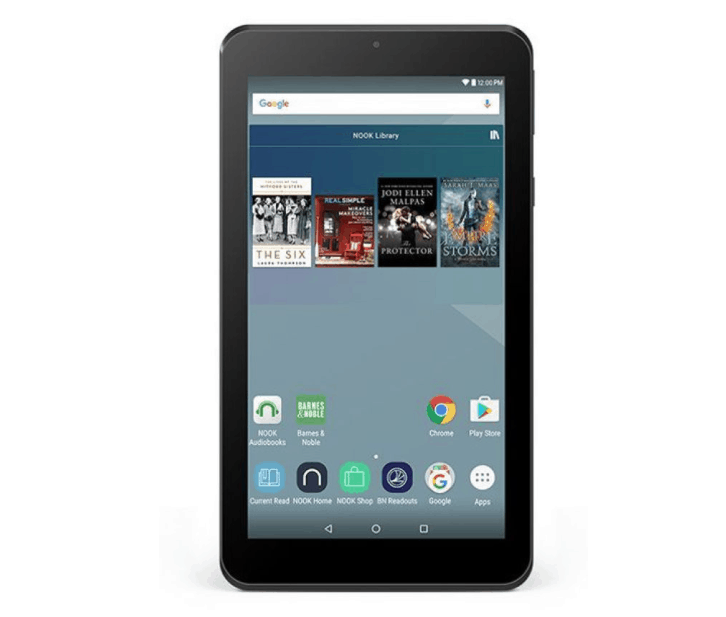 Barnes & Noble just announced the Nook Tablet 7 (sounds like a supervillain team, doesn't it), its cheapest Android tablet yet. This $50 wonder is a rebranded Chinese tablet running Android 6.0 Marshmallow on a 1.3GHz MediaTek CPU. It comes with Google Play and runs the Nook apps on top of a stock Android install, just like the FCC paperwork lead us to expect. It has 8GB storage, a microSD card slot, and the usual Wifi and Bluetooth. Its 7" screen has a resolution of 600 x 1024. That is rather low, even for $50 tablets, but the tablet makes up for it with the cameras. It has both front and rear cameras with resolutions of 2MP and 5MP, respectively. All in all that's not a bad spec list, but of course the real question is the quality of the software, the constriction, and the cameras. As we have seen with the $50 Fire tablet, it is possible to make a decent tablet at that price. But can B&n pull it off? That is another matter. I myself am impressed by their deck chair shuffling skills. Basically the exact same specs as the $50 2015 Fire, except that it’s using the 2016 Fire HD 8’s CPU. Impressive that they were able to match the Fire’s $50 price. I wonder if they’re actually losing money on it, or if they’ll be prepared to try to follow through with a push to sell more media for it? I don’t see anything about accessibility features such as text-to-speech either. The Nook Android app, which is presumably what will be on this tablet, has read-aloud capability. This “Nook Tablet 7” will be the seventh Nook tablet. It is nice there is not a skin over Android, just some Nook apps added to it. I don’t like the skins most companies apply over Android. Well, there will probably be a custom launcher, which I’d kind of like a “skin over Android.” But it should be easy to replace. Saw it yesterday at the B&N in Tyson’s Corner VA. The display model seemed to run smoothly and came with the Google Playstore. If I’m remembering correctly it was running Android 6. The screen looked acceptable though I couldn’t check it with a book.